It’s a Shopping Frenzy! LoA2 Black Friday Rush Sale! Are you ready to fill your shopping carts? 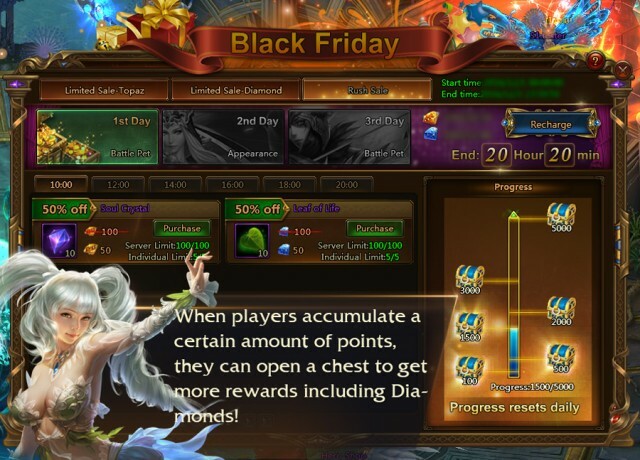 In the Black Friday panel, there are 2 tabs, Topaz and Diamond special. You can buy all kinds popular items like Suits, Mounts, and Battle Pets at insane discounts! Players can add everything they want to the shopping cart and the system will calculate the total cost. When the total reaches a certain amount, players will enjoy the corresponding discount. For example, when the total cost is 2000 Diamonds, which has a corresponding discount of 30%, then you will only need to spend 1400 Diamonds! 1)Every time you checkout, the discount stacking progress will be reset after purchase. 2)The discount stacking progress of Topaz and Diamond are calculated separately. A ton of new Topaz and Diamond Vouchers will be given out in the Black Friday events! You can use these Vouchers to pay instead of Topaz or Diamonds (1:1 ratio)! Up to 60% of the total price can be paid using Vouchers! 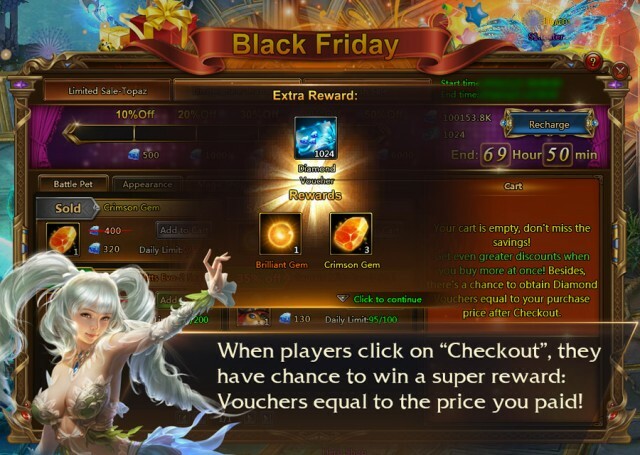 When players click on “Checkout”, they also have chance to win a super reward: Vouchers equal to the price you paid! For example, if you spent 300 Diamonds, you can win 300 Diamond Vouchers as the super reward and use them for your next purchase! Rush Sale will run from 10:00 to 22:00 each day during the event. Every item in Rush Sale will be greatly discounted, up to 90% OFF! During the 3-day event, Rush Sale will cycle through many items, so check often to find what you’ve been waiting for! Items in Rush Sale are limited in quantity for each server. A new batch of items will be added every 2 hours, and players can buy them before 23:59:59 that day. Players will earn 1 point for every 100 Diamonds they spend. When players accumulate a certain amount of points, they can open a chest to get more rewards including Diamonds! 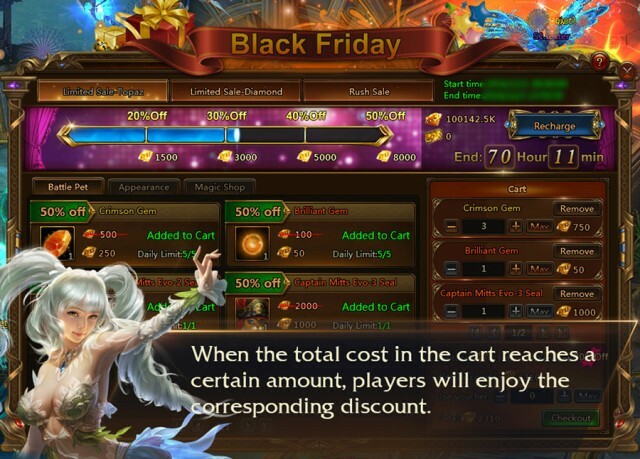 Go on a shopping spree with LoA2 and avoid the chaos of Black Friday in real life. This event only comes around once a year, don’t miss the crazy deals!